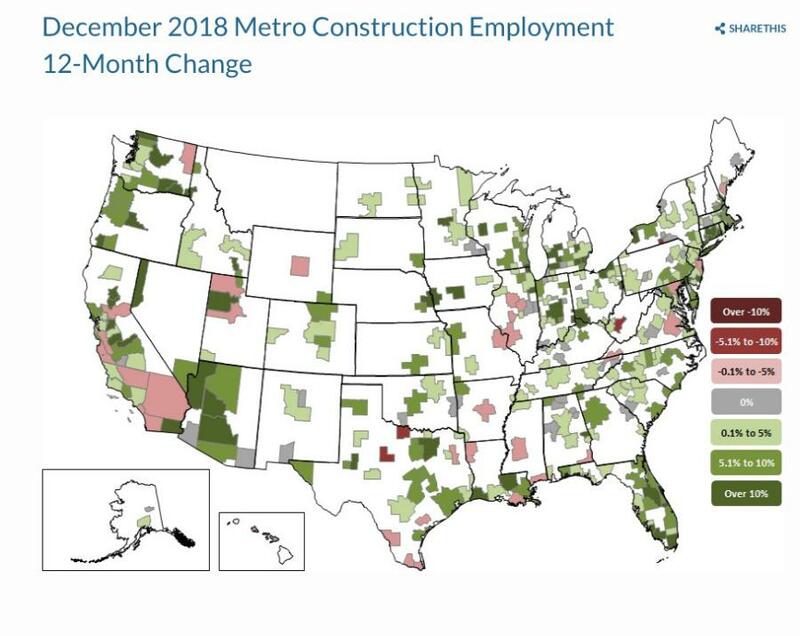 Construction employment grew in 273 out of 358 metro areas between December 2017 and December 2018, declined in 37 and was unchanged in 48, according to a new analysis of federal employment data released Jan. 29 by the Associated General Contractors of America. Association officials said the job gains came amid strong demand throughout 2018 for construction projects but noted that tight labor market conditions likely prevented additional job gains last year. The Houston-The Woodlands-Sugar Land, Texas metro area added the most construction jobs during the past year (19,400 jobs, 9 percent). Other metro areas adding a large amount of construction jobs during the past 12 months include Dallas-Plano-Irving, Texas (17,700 jobs, 13 percent); Phoenix-Mesa-Scottsdale, Ariz. (16,200 jobs, 14 percent); and Orlando-Kissimmee-Sanford, Fla. (11,400 jobs, 15 percent). The largest percentage gain occurred in Weirton-Steubenville, W. Va.-Ohio (28 percent, 500 jobs), followed by Hartford-West Hartford-East Hartford, Conn. (23 percent, 4,300 jobs); Bridgeport-Stanford-Norwalk, Conn. (23 percent, 2,600 jobs) and Lewiston, Idaho-Wash. (23 percent, 300 jobs). The largest job losses between December 2017 and December 2018 occurred in Anaheim-Santa Ana-Irvine, Calif. (minus 2,800 jobs, minus 3 percent), followed by San Diego-Carlsbad, Calif. (minus 1,900 jobs, minus 2 percent) and Honolulu (minus 1,500 jobs, minus 5 percent). The largest percentage decrease occurred in Lawrence-Methuen Town-Salem, Mass.-N.H. (minus 9 percent, minus 300 jobs), followed by Abilene, Texas (minus 7 percent, minus 300 jobs); Wichita Falls, Texas (minus 7 percent, minus 200 jobs) and Elmira, N.Y. (minus 7 percent, minus 100 jobs). View the metro employment rankings, top 10, history and map.